In January of 2017, my pal, Marianne Ways, one of NYC's premier producers of comedy and variety shows (a few years ago, she convinced me to create/curate and host a few of my own salons at Union Hall in Brooklyn, NY), contacted me to illustrate a superhero conceived by comedian/actor Wyatt Cenac. They were producing a televised version of their variety show, Night Train with Wyatt Cenac, and one of the segments would riff on cos-play and comic book conventions. 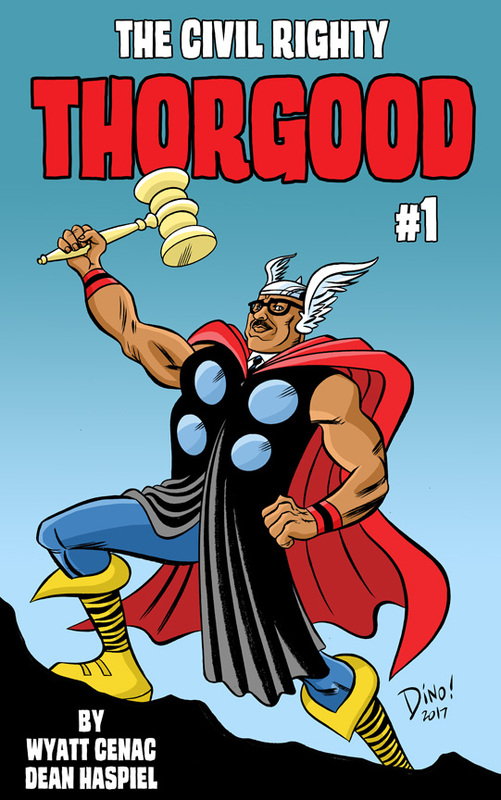 Wyatt came up with his new superhero based on a combination of lawyer and former Associate Justice of the Supreme Court of the United States, Thurgood Marshall, and Norse god, Thor, called THORGOOD. It was very easy to design and was fun to collaborate with the comedian. They recorded the episode early February, 2017.